Become a permanent and visible part of the Rollins campus. Order a personalized brick for you or a loved one with a minimum contribution of $250 to the Alumni Association. Brick orders are accepted year-round. The order deadline for bricks to be placed by graduation is February 15, 2019. Established by President Emeritus Hamilton Holt, the Walk of Fame contains more than 200 stones representing celebrated artists, authors, and other historic notables. 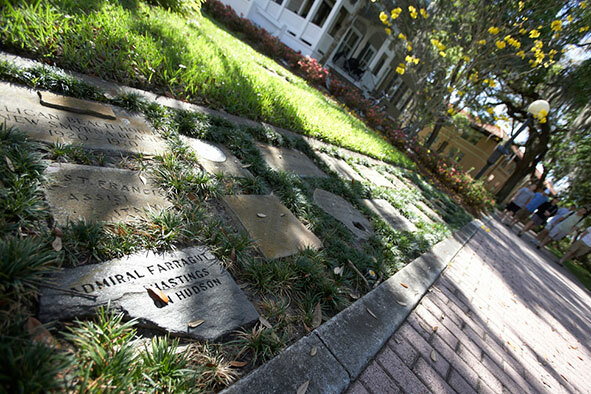 Honor your achievements, commemorate your time on the Rollins campus, and support your alma mater with a brick on the Walk of Fame, a historic Rollins landmark. 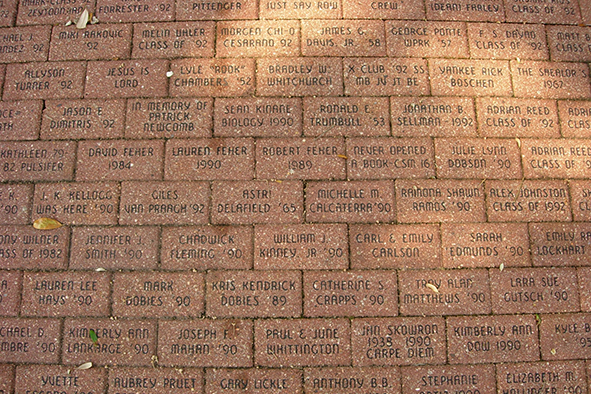 The engraved bricks, placed along the brick pathway around The Green, are also the perfect way to commemorate a loved one or classmate, or to celebrate a student’s graduation from Rollins. For a minimum contribution of $250 or more to the Alumni Association, you will receive one 4” x 8” brick with a personalized inscription of your choice. Each brick can accommodate two lines of engraving with up to 15 characters on each line, including spaces. To reserve your brick, complete our order form. Brick orders are accepted year-round but only placed annually in April. The order deadline for bricks to be placed by graduation is February 15, 2019.